A gamer from Perth who is happy to try almost anything, Matt is highly passionate about the world of games and wants to show everyone why they are so great. Also likes sport and anime too! I always find it crazy to think how far simulation games have come over the last few years. Back in the early days of gaming, simulations were few and far between, and while they were great (The Sims, anyone? ), there wasn’t too much variety between them. Thanks to the dawn of indie developers and programs such as Steam Greenlight, more and more unique titles have started to pop up. 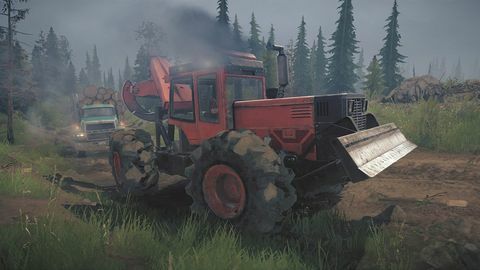 Simulation games can now be found around every corner, and cover everything from farming and slapstick goating to firefighting, and in the case of this review, driving big trucks. 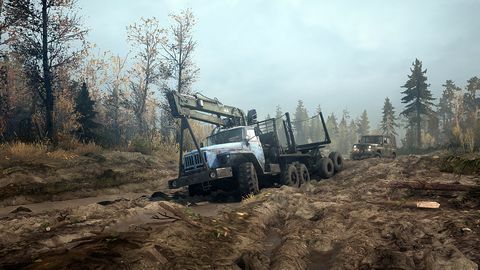 Spintires: Mudrunner is an off-road driving simulation game developed by Saber Interactive and published by Focus Home Interactive and originally released in 2017. With the recent release of the game’s American Wilds DLC, let’s grab the wheel and take a look at what the complete package brings to the table. Despite the gritty, realistic look the developers went for, you have to commend their efforts at presenting off-roading at its dirtiest. Like many other simulation games on the market, there isn’t much in the way of setting and story in Mudrunner. This game is all about dropping you into a muddy world and letting you do whatever you want. Right upon loading the game for the first time, the tutorial provides a nice, simple introduction to the basic mechanics and allows you to become somewhat accustomed to how the numerous vehicles feel and control. It’s a nice addition that a lot of other simulators like to hide behind their other main modes, but it feels right for games such as this to provide that much-needed helping hand so newcomers aren’t completely lost. Once you complete the tutorial, it’s up to you where you decide to go next! Saber Interactive definitely made good on their "Mudrunner" moniker, because this game gets down and dirty really quickly. From the word go, the main menu features a drained and weary colour palette, and once you’re dropped into the tutorial you’re greeted by wet muddy roads and grey overcast skies. Even the vehicles in the game are afraid of colours, being presented as already having been around the muddy block a few times, with bland paint jobs and grime and muck caked all over their weathered bodies. Despite the gritty, realistic look the developers went for, you have to commend their efforts at presenting off-roading at its dirtiest. The particle effects are also handled quite nicely and show mud clinging and sticking to tires or a good solid splash when trudging through water. Speaking of splashing, Mudrunner also does a good job at handling sound effects. Revving an engine, splashing through puddles and squelching in mud all sound quite satisfyingly authentic, and help immerse you in the many vehicles you'll utilize during your time in the grubby countryside. Unfortunately, I do wish there was some music to accompany this game, as apart from some vague country music you can kind of hear in the distance when you’re near certain buildings, there is absolutely no soundtrack to speak of. Overall, while Mudrunner’s presentation isn’t bad, I do wish there was a bit more to it. I will say that it does feel right for the style of the game, so I can’t be too harsh there. 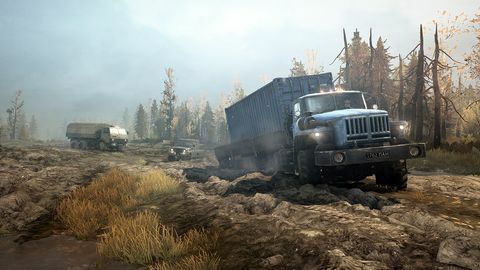 Mudrunner’s gameplay consists of utilising the various vehicles at your disposal (be it car, truck, or other massive four-wheeled beasts) to perform different tasks within the world. Completing the tutorial brings you to the two main modes of the game; Single Player, and Challenges. The main single player mode lets you choose one of the many different maps available, and then loads you into a car at that map’s garage. From there, you are tasked with delivering a certain amount of wooden logs (the number varies depending on the map you choose) to the lumber mills found somewhere in the world. These wooden logs must also be located, although they are usually much closer to the player than the lumber mills. Challenge mode consists of a selection of shrunken down maps, with more specific tasks for players to complete using specific vehicles. These can vary from delivering a trailer from one end of the map to the other, to simply climbing a steep hill. Each challenge also comes with a star rating upon completion, which only gets higher if you complete even more specific objectives within each challenge. These challenges make for a nice a break when you’re feeling a little drained of the single player mode, and the addition of star ratings makes replaying each one much more worthwhile for those wanting an even more difficult time. Funnily enough, that’s the only objective to the single player mode. Simply deliver logs from A to B. Where the true gameplay comes in is with how you do deliver the logs. With a plethora of vehicles to aid you and a myriad of customizations possible for each of them, there are endless possibilities as to your method of wood delivery. Will you opt for the simpler truck, or go for the trickier to use but more effective skidder? Will you head straight to collecting logs, or will you explore the map a bit, taking time to reach navigation outposts that will help you get a better grip on your surroundings? 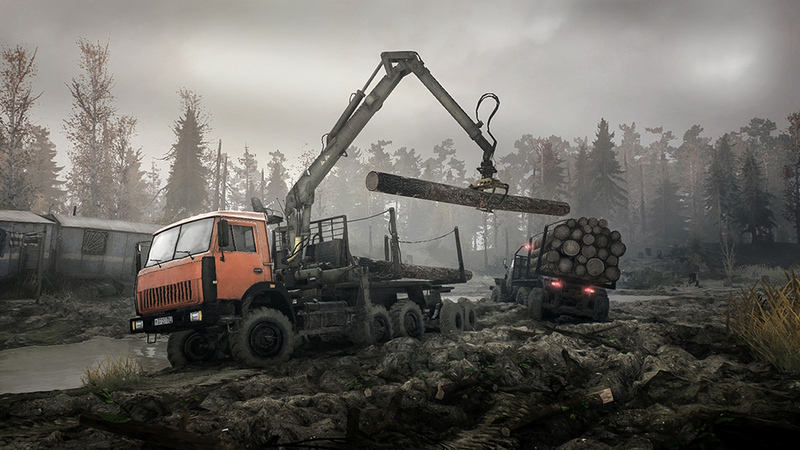 Will you collect your logs from the log station, or risk damaging your vehicle to scavenge them elsewhere? 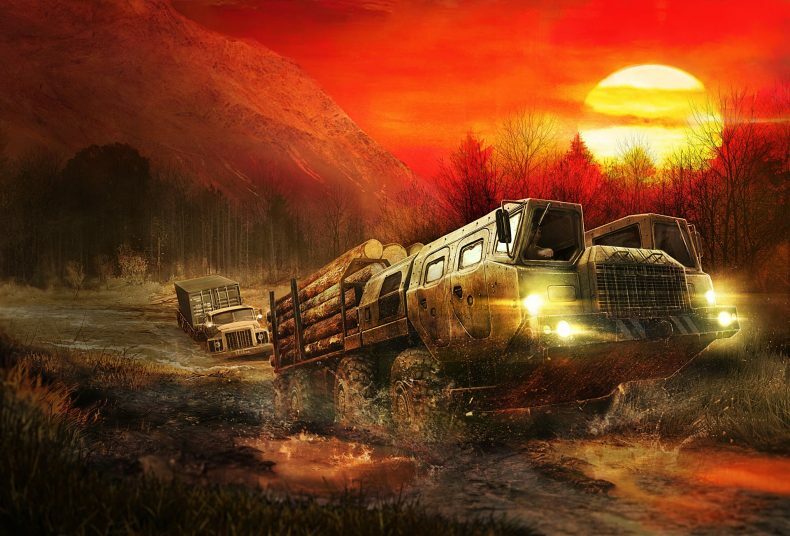 Mudrunner, like many other simulators, draws a lot of its fun from player choices, and it’s what will keep players returning again and again. All of the vehicles are quite tricky to handle, though that is expected from some of the enormous trucks in this game. 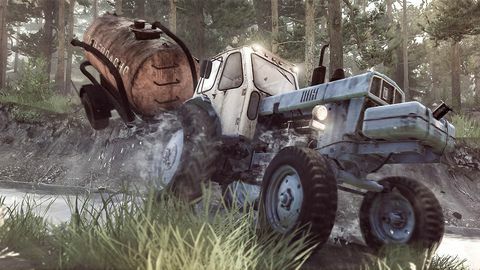 This can, however, cause frustrations while playing, such as the ease at which certain trucks can get bogged down in mud, or stuck in dense woods. This would be ok if there was an easily accessible guide to help you out in these situations, but unfortunately, there isn’t. While the tutorial I mentioned earlier is a good addition, I did also say it only covers the “basic” gameplay, and won’t prepare you for what to do when you’re losing (or have already lost) your truck to the nature around you. While I’m sure there are ways to get out of situations like this, the game itself isn’t great at explaining a lot of its more intricate mechanisms. 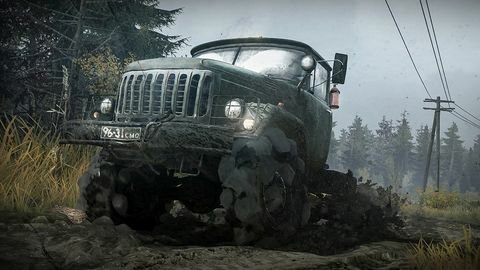 Spintires: Mudrunner is a fascinating driving simulator that hits the mark in some areas, but falls short in others. The vast choice of customizable vehicles and attention to detail in the world are great to behold, but the lack of any music, somewhat tough to operate controls and a shortage of deeper mechanic explanations let the game down. 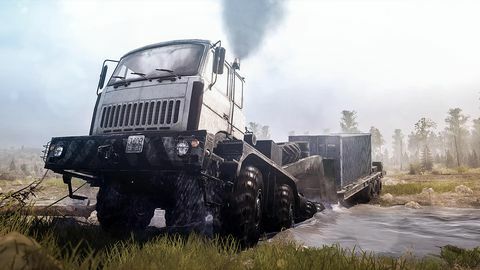 I came away from Spintires thinking one thing above anything else: this is a game for a niche community of gamers. If you are someone who has never had any experience with off-roading or what it is like, then you may have a tough time here. However, if you are a fan of trudging through the dirt and mud in behemoth-like trucks, then you might like what Saber Interactive has in store for you. Just be prepared to take the time learning how to get out of that dang mud! dirty but somewhat fulfilling experience you can return to again and again. different play session unique. 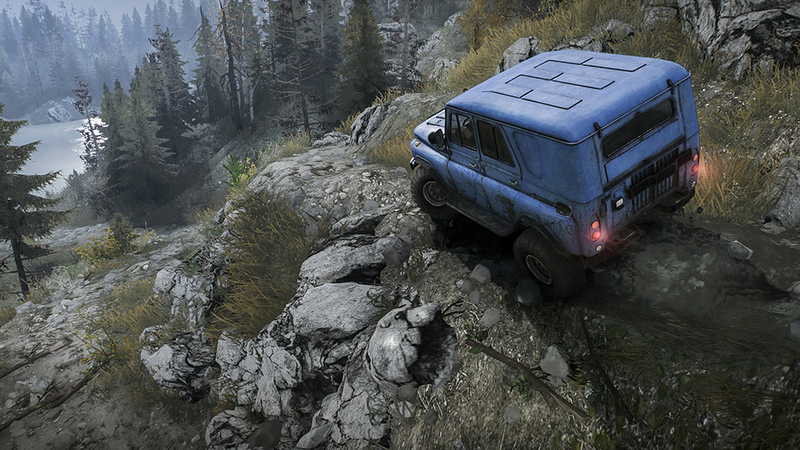 Visual effects emphasise the dirtiness of off-roading. leave newcomers feeling frustrated and confused. No music feels like a lost opportunity.